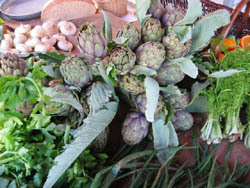 Fresh zucchini blossoms can be eaten raw or cooked and eaten. Many chefs remove the pistils from female flowers, and stamens from male flowers, although both of these are edible and have flavor. The male stamen contains the pollen. There are a lot more male squash blossoms than female and they begin blooming earlier. 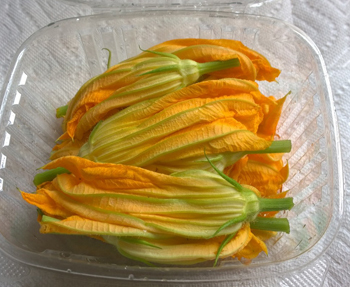 Zucchini blossoms can be found during the summer months and many Greenmarkets. Zucchini Blossoms purchase as Union Square Market. 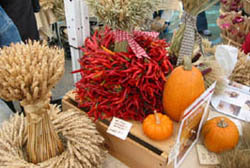 Although it is best to use within a day or two Zucchini Blossoms can be frozen and still used. Frozen blossoms when thawed however cannot be stuffed. Difference between Male and Female Zucchini Blossoms. This dish is prepared in a similar way to classic risotto. Saute onions in a little bit of oil, add white wine and reduce then stir in the orzo for a minute. Add the chicken stock and continue to add stock as it is absorbed. Before you start the dish the saffron should be added to a small amount of warm chicken stock and white wine to help release the flavors. We add some marscopone and parmesean cheese at the end of cooking. Before finishing we add the chopped zucchini blossoms and garnish with parmesean cheese. 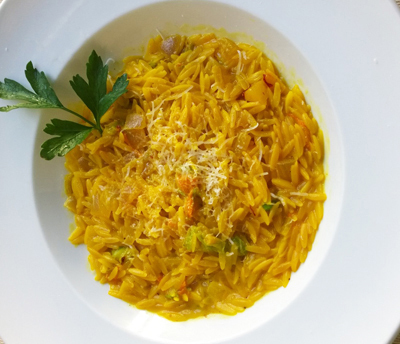 Combining Zucchini blossoms and saffron is a common dish in Italy with varying pasta used. Both fresh pasta and dried pasta work well.